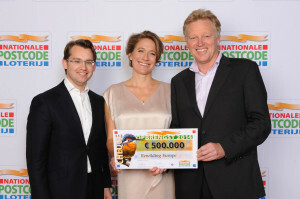 The Rewilding Europe initiative received a €500,000 check from the Dutch Postcode Lottery at the annual Charity Gala (Good Geld Gala) on 26 of January in Amsterdam. During the gala, the lottery proudly announced that thanks to its 2.5 million participants who bought more than 4 million lottery tickets collectively, a new record amount of 312 million euros will be distributed to non-governmental organisations in 2015. Rewilding Europe became a beneficiary of the Dutch Postcode Lottery in February 2013. The initiative receives an annual donation of €500,000 for a period of five years. Major gifts were provided to two ‘Dream Projects’ from the Dream Fund, to enable courageous, groundbreaking new projects. These included major gifts to a coalition of 6 Dutch conservation organisations (including our initiating partners WWF Netherlands and ARK Nature) for restoration of the ‘Haringvliet’, and old sea-arm in the Dutch Delta area that will be re-connected again with the North Sea, and for Sea Shepherd to combat illegal fishing and poaching in the Southern Ocean. The Dutch Postcode Lottery has been raising funds since 1989 to support organisations working towards a fairer and greener world. Fifty percent of the lottery’s annual turnover goes to charity. The lottery has steadily grown to become the biggest charity lottery in the Netherlands and supports 92 non-governmental organisations. Since its founding, the lottery has dispensed over 4.4 billion euros to its beneficiaries. Novamedia/Postcode Loterijen is third largest charitable donor in the world.